Voyager is a mission with no shortage of highlights, given its historic encounters with all the giant planets and the first-ever entry of a human-made object into interstellar space. We asked team members past and present and next-generation scientists and engineers inspired by Voyager to share their most meaningful moments over the decades. For me, the highlights of Voyager were clearly the planetary encounters. All six of them were wonderful experiences where every day we saw and learned new things. We had a lifetime of discovery packed into each one. There was a regular routine: In the afternoon we had a science meeting where individuals would say, "This is what we’ve seen" or “This is what we think" or “This is what we don’t understand.” Members from all 11 science teams participated, packing the conference room. These daily science meetings were a form of real time peer review that was also a way to choose which observations to report at the press conference the following morning. After the meeting, I would work with the investigators in outlining graphical illustrations that could be prepared overnight for use at the press conference at 10 a.m. In parallel, the imaging team would choose the images and prepare the captions for those that would be printed overnight for distribution to the reporters gathered at JPL. That afternoon, we would do it all over again with another day of observations and analyses. If I had to pick a favorite memory, it would be the discovery of active volcanoes on Io. It was Friday afternoon, March 9, 1979, four days after Voyager’s closest approach to Jupiter. The final press conference had wrapped up the day before. So, the reporters had already left and many of the scientists had gone home for the weekend. It was a very quiet afternoon. 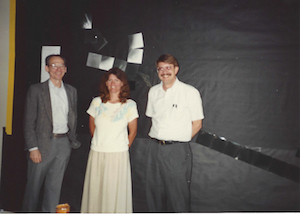 Andy Collins -- who worked with the Imaging Team -- came to get me, saying, “You’ve got to see this.” He took me to Linda Morabito, an optical navigator, who determined the precise locations of Jupiter’s moons by analyzing Voyager pictures of them with a background of stars that had known positions. The latest picture of Io revealed a feature extending well beyond the moon’s disk -- it was an erupting plume shooting far above Io’s surface, an active volcano. The eruptions on Io were the first direct evidence of active volcanoes elsewhere in the solar system. Even though Io is much smaller than Earth, it had ten times as much volcanic activity. This astonishing discovery clearly signaled that we could expect many more surprises. And Voyager has certainly revealed a remarkable diversity of planets and their moons, rings and magnetic fields that has changed our view of the solar system. I arrived at Caltech as an incoming graduate student in the late summer of 1967 and began work in the Space Radiation Laboratory, headed up by Robby Vogt and Ed Stone. I passed my thesis exam in March 1973 and I continued that summer with my thesis experiment, launching it on a balloon from Fort Churchill, Manitoba. It’s a long story, but something went wrong with the cut-down mechanism and we lost our experiment -- to the Russians! We did eventually get it back, but it was a hopeless pile of junk. So, I was put on a new project that was just starting -- the Cosmic Ray Subsystem (CRS) experiment for Voyager. I was put in charge of testing the detectors for the Low Energy Telescope (LET) and The Electron Telescope (TET). One component of the LET telescopes was the front covering that we called a window, which was made of aluminum and very thin, 3 microns thick. The windows were mounted on circular lids that screwed onto the bodies of the telescopes. We were worried that the technicians working around the spacecraft would accidentally poke a hole in them, so we had spares available just in case. That led to my first memorable moment: I got to inspect the windows just before the spacecraft was sealed up for launch. I climbed up in there and inspected the windows. That was exciting! My next memorable moment was when Voyager 1 encountered Jupiter, the first planetary encounter for either Voyager. Since Ed was the project scientist, I sometimes got to occupy the CRS chair at the table where the scientists gathered to discuss what discoveries were going to be presented at the press conference the next morning. I remember seeing the image of the moon Io for the first time and thinking that the Caltech students had engineered a brilliant stunt -- they must have substituted a picture of a poorly made pizza for the picture of Io! All that orange and black on Io changed our thinking about the moons in the solar system. I think most of us thought they would all look more or less like our own Moon. But, wow, how wrong was that! The discussion at the table about whether we were looking at an old or a new surface was fascinating and was put to rest a few days later with the stunning discovery of the volcanoes erupting in real time on Io. Finally, for me, a cosmic-ray physicist, one of the highlights by far has been the crossing of the heliopause, the boundary of the Sun’s magnetic bubble, into interstellar space by Voyager 1. The Voyagers will orbit the center of the galaxy forever. It is humbling to think that I’ve been a part of such a fantastic mission. Looking back, I think losing that balloon in summer of 1973 was a good thing, as Voyager has been a career mission for me and I could not imagine a better one. I started working for the Voyager Imaging Team in 1977, shortly before launch, and continued on through the Neptune encounter. There were so many memorable moments, but one of my favorites occurred in the spring of 1990. On February 14, 1990, Voyager took a series of pictures of our solar system. Individual planets were imaged with the narrow-angle camera, while the star background behind and between them was captured with a series of wide angle camera images. The layout of the wide-angle pictures vaguely resembled a child’s hobby horse. When all the pictures had been downlinked, we printed out hardcopies and pinned them up on the wall in the Voyager imaging team library. This is a picture of Ed Stone, me, and Torrance Johnson standing in front of those pictures. The Sun is the bright dot above and between Ed and me. The narrow-angle image of Earth would have been embedded in that wide-angle image of the Sun. Some months later, Jurrie Van der Woude put together a display of this portrait of the solar system, covering a substantial fraction of the wall in the Von Karman Auditorium at NASA's Jet Propulsion Lbaoratory. At that scale, the narrow angle images of the planets could be displayed with the wide-angle mosaic. Jurrie said that he had to replace the picture of Earth rather often -- people always wanted to touch it. Back in 1989, I was hired by NASA’s Jet Propulsion Laboratory to work on the General Science Data Team for the Voyager project’s Neptune flyby. Incredible! My first job at JPL was on what could reasonably be argued as the best mission ever flown by JPL at the peak of its experience and capabilities. The project was in the late stages of planning and then executing the 1989 Neptune encounter -- Voyager’s last great planetary encounter. The team had been working together for decades and I remember being amazed at how smoothly everything and everyone worked. The lines of communication between teams and people were crystal clear. Everyone knew everyone else; they knew what they did, they knew what they could do, they knew whom to talk to, and who was a reliable backup. 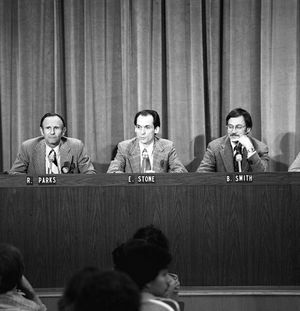 At the time, I didn’t know enough to appreciate how fantastic Ed Stone was as project scientist, but having worked several missions over my 30 years at JPL, I can tell you I think he was one of the best ever! As encounter day approached, there were press camped out in trailers down Mariner Road for as far as the eye could see. Every day, the smudge of Neptune kept getting bigger and bigger and more resolved and more beautiful on the screens showing the latest images. And -- there were screens everywhere! All around the lab, in the cafeterias, in the conference rooms, in the hallways -- you couldn’t help but be caught up in the ever-growing resolution of the images. In the haze of “first job naivete” I thought, “Well, this is what working at JPL is like. This is how it will always be.” I didn’t appreciate the experience for its absolute uniqueness until many years later. 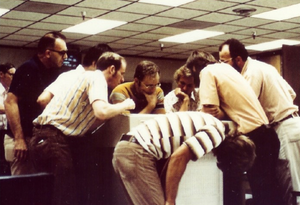 How I wish I’d listened to my mother and written a journal during that first year of working at JPL. 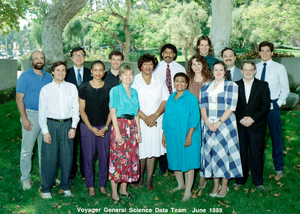 Looking back, working on Voyager was a key formative experience in terms of setting my expectations about what a mission can do; how a mission team behaves; how your work colleagues become a family; what it takes to be successful at JPL; what it takes from the team for our mission to be successful; and ultimately what a JPL team can do to change the world. What a gift. I have had the unspeakably good fortune to have worked on Voyager throughout my entire career and to continue to do so. As a graduate student, I worked on the Plasma Wave Science (PWS) instruments prior to launch. (I placed a “Uranus or Bust” sticker on the Voyager 2 PWS shipping container – how little I knew about how far it would go!). I defended my doctoral dissertation just one month before Voyager 1 flew past Jupiter. I continue to monitor PWS data as Voyager 1 passes 139 astronomical units and Voyager 2 approaches 115 astronomical units. I processed the data showing plasma waves near 2 kilohertz in 2012 that showed definitively that Voyager 1 had entered interstellar space. One of my most memorable moments occurred in early March 1979 at the Jet Propulsion Lab. Fred Scarf and I were watching PWS data come in as they were beamed from Voyager 1 onto simple printouts and plots that were state of the art, at the time. In our workspace, there was a very small black and white monitor that occasionally showed unprocessed PWS high-rate observations. 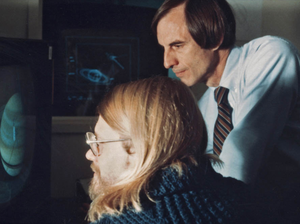 However, most of the time, these monitors displayed the most recent image from the Voyager Imaging Science Subsystem – the camera. The display was riveting. Each day and each hour, the images became clearer and more detailed, and new worlds were literally being unveiled before our eyes. At the same time, the PWS data were showing evidence of radio and plasma waves never before observed in a magnetosphere beyond Earth. Fred surprised me, one day, by saying how very sad he was for me. He said that it was so sad that I was experiencing Voyager so early in my career, because it would never be so good again. 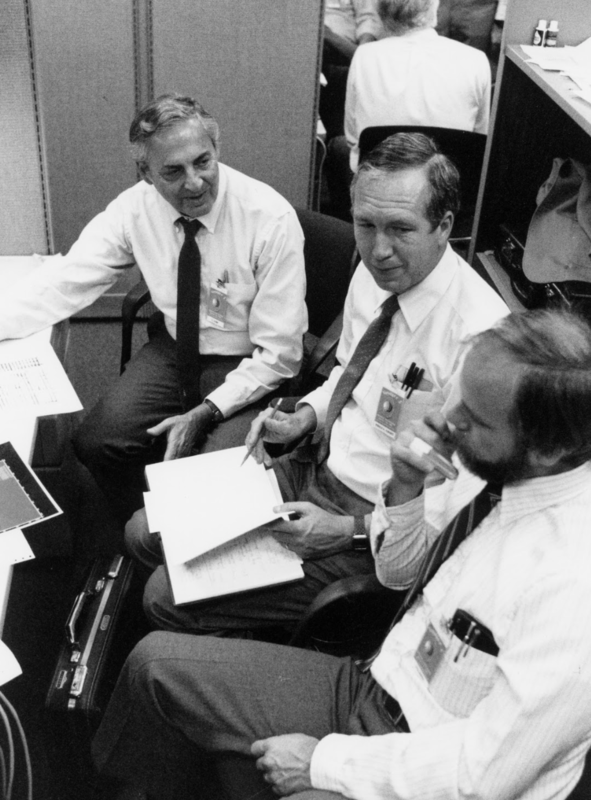 Of course, what Fred did not know was that the Voyagers would visit not only Jupiter and Saturn as was the mission plan, but also Uranus and Neptune. Nor did he realize that the Voyagers would still be telling us about the outer heliosphere and interstellar space 40 years after their launches. I’m only saddened that Fred did not live to see that Voyager’s mission of discovery extended for more than 40 years and spanned the entire distance to the heliopause (where our sun’s plasma ends) and beyond. Certainly, I have been a part of other exciting and fruitful planetary missions including Galileo, Cassini, and Juno. But, in my heart there is one above the rest – Voyager, the mission that paved the way for so many more. In July 1979, Voyager 2 flew past Jupiter and Europa. The Photopolarimeter instrument (PPS), which measures polarized light, came out of the Jovian radiation field with damaged command shift registers and loss of control over aperture, color filters and polarization measurements. But, the basic instrument was still functional. 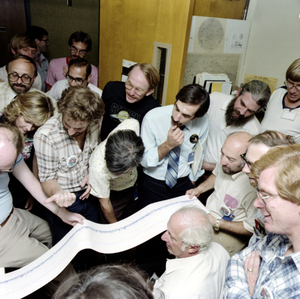 Over the next 18 months, the Voyager mission operations team at the Jet Propulsion Laboratory worked with the PPS scientists and engineers to develop operational codes to enable measurements at Saturn and to perform a long-duration stellar-ring occultation sequence, where scientists can learn more about the rings by watching how they block starlight. But, the aperture wheel remained “stubborn” in its performance. Sometimes the aperture wheel was fully open (a position of 161 or 162-163) and sometimes it only moved on command to a half-open position, which would not work properly for the ring occultation. In spite of special “exercise” routines to clean the aperture wheel’s electrical contacts, the commanded positions were only proper about half of the time. During the course of the approach to a near encounter with Saturn, the PPS team commanded the aperture wheel more than a dozen times to see if a pattern could be discovered that would provide higher confidence. The proper position would occur when the ring occultation measurement was to begin. We thought we found a weakly correlated pattern that might give a better than 50 percent chance of the proper setting. Coming into the near encounter, the instrument was given one last wheel contact cleaning operation and then everyone just had to wait to see what would occur. 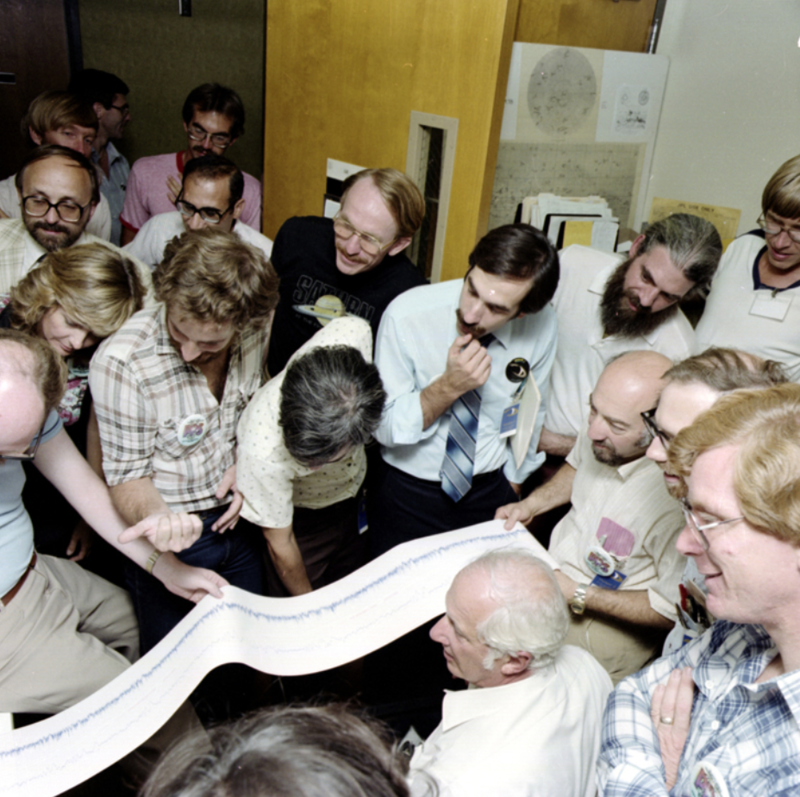 The team and a number of spacecraft engineering personnel gathered at JPL where the telemetry line printers were spewing out pages of engineering status reports. The operations team transferred the PPS telemetry channels to the overhead video monitors. We all waited for the critical command event; everyone who knew what was at stake was nervous with anticipation and some dread. The appointed time arrived. Everyone was watching the monitors. Aperture wheel position number 161 suddenly appeared and everyone was cheering. The occultation measurement was going to be a success! Two hours later the measurement ended and the recorded PPS intensity data were transferred to magnetic tape and given to us to format and graphically print at the PPS data computer room in building 264. The PPS data computer drove a high-speed analog strip chart recorder that began to pour out squiggly lines representing time of measurement and star intensity. A single paper plot over a quarter of a mile long showed the attenuation of the starlight by the ring material, at a resolution of greater than 20 meters, for the entire 70 million-meter length of the cut through the rings’ radius. What a spectacular event that unfolded after so much hard work by so many people! Part of the challenge was that certain conclusions could only be drawn from actually “being there,” and in mid-August 1989, Voyager was bearing down on its rendezvous with Neptune. The various “fields and particles” instruments were measuring the conditions in the solar wind at the spacecraft. All we needed to know was exactly where the wind stopped, and from that, we could deduce the strength of Neptune’s planetary magnetic field. So, we waited, and then we set up a prediction pool -- when we would know we were at the boundary of Neptune’s influence in the solar wind. And, we made a list on a chalkboard in one of the rooms at the Jet Propulsion Laboratory assigned to the science teams (as shown in this picture). The prediction was for when Voyager 2 would fly into the “bow shock” of the magnetosphere of Neptune in PDT-ERT (Pacific Daylight Time-Earth Received Time, which was the time the data arrived back at the computers at JPL in California). So, there were only five entries -- beginning at Day of Year (DOY) 235, also known as August 23rd (in non-leap years). At the flyby, the one-way light time was 4 hours and 6 minutes. The spacecraft event time (SCET) is typically given in Greenwich Mean Time (GMT), so to go from PDT-ERT to GMT-SCET, add 7 hours to get to GMT, but the event occurred on the spacecraft 4 hours and 6 minutes earlier, so that has to be subtracted off, a difference of 2 hours and 54 minutes. My guess was a lot later than the others, and in favor of a smaller magnetic field, hence, first seen closer to the planet. I picked 12 noon on DOY 236 -- that is, August 24th at 1454 GMT-SCET. The Plasma Science experiment detected the bow shock on the 24th of August at 1438. Not too bad! But, the truly amazing things are that this was documented and the photo still exists. 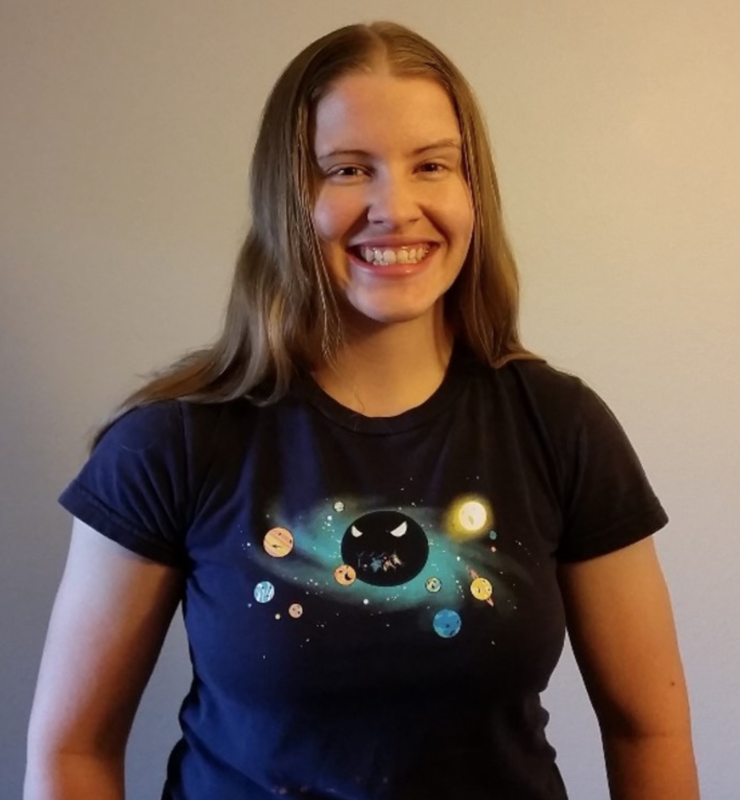 I loved adventure stories as a child, turned to science fiction as a young adult, studied math and physics at Georgia Tech, often gazed at the night sky and dreamed of one day exploring the planets. After learning the tricks of the trade at the Jet Propulsion Laboratory, I was thrilled in late 1974 to receive a call from Bud Schurmeier, project manager of the Mariner Jupiter/Saturn 1977 mission (or simply MJS77), which was later named Voyager. He offered me the job of “mission analysis and engineering manager.” I would be working with the great team of dedicated people Bud had assembled. The mission design at that point needed to be redesigned for two reasons. First, the Pioneer 10 and 11 missions had discovered that Jupiter's radiation levels were much higher than previously thought, so we would need to use less sensitive electronic parts and/or cover some parts with tantalum shields. Bud also wanted me to pick trajectories that would allow Voyager 2 to make a second pass at Saturn’s moon Titan if Voyager 1 failed -- or continue on to Uranus and Neptune if Voyager 1 succeeded. In time, we winnowed roughly 10,000 different launch-date/arrival-date possibilities down to 98 to cover the launch period, finally launching Voyager 2 on August 20 and Voyager 1 on September 5 of 1977. That was the Goldilocks year for the launches, allowing us to have great encounters with Jupiter's Galilean moons while also preserving the option to fly the “Grand Tour” on to Uranus and Neptune. Such a unique opportunity occurs every 176 years --- so there won't be another chance until 2153. The greatest scare during launch was booster under-performance for Voyager 1 that left only 3 seconds of burn time in the Centaur tanks before setting off for Jupiter. 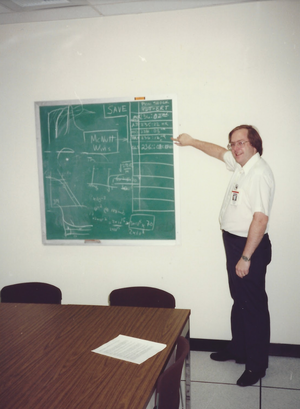 After launch, John Casani, who was then the project manager, invited me to stay on as “mission planning office manager." This allowed me to interact with Voyager’s worldwide fans in memorable ways including educational presentations to dedicated science teachers, gee-whiz facts to the eager public, and even meeting several of my own heroes. I had many memorable encounters with personal heroes of mine because of Voyager. I met science fiction authors Arthur Clarke and Ray Bradbury, had several meetings with Carl Sagan, spent a full day with astronaut Neil Armstrong, attended meetings with Bill Nye as an advisor to The Planetary Society, worked with computer graphics pioneer Jim Blinn to produce all six Voyager flyby animations, and attended a black-tie evening event with musical composer John Williams. I kept praising him for his brilliant musical scores, while he responded that he could not imagine designing a mission to the outer planets. Scientists and science fiction writers were naturally drawn to Voyager, as it represented a great voyage to faraway worlds that these people had always dreamed about. I arrived in Pasadena, California, to begin graduate school at Caltech on Friday, August 31, 2012 -- just six days after Voyager 1’s own interstellar arrival. My new advisor, Ed Stone, invited me to attend the Voyager Science Steering Group meeting which started the following Monday. But, I did not go unnoticed. Dr. Stone saw me and smiled as I came in, and introduced me to the whole group. Suzanne Dodd even joked that they should include my picture on the front cover of the SSG report. The Voyager team was incredibly kind and welcoming, and I very quickly found myself at home in my new home. Currently, my work on Voyager involves examining how the intensities of galactic cosmic rays change through their interactions with the heliosphere. Even now, five years later, my time here as a graduate student at Caltech continues to be an incredible scientific journey -- I am greatly blessed and humbled by the privilege of working with Dr. Stone as my advisor and writing my thesis using the latest Voyager data -- humankind’s first in-situ measurements of interstellar space! These spacecraft are more than a decade older than me, and yet are still on the cutting edge, pushing the boundaries of humankind’s understanding and ability to explore space. Every day as a graduate student here is like living in a legacy of discovery.